Every organization is unique, but Dasher takes the same first steps for each client: Understand your organization, earn your trust, and design IT solutions that are relevant and cost effective. As one of the fastest growing IT solution providers in the country, Dasher has a reputation for effortless implementations with relentless follow-through and enduring support. Since 1999, we’ve helped public, private and nonprofit organizations implement technology solutions that increase efficiency and simplify operations. 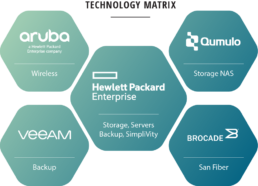 For nearly 20 years, Dasher and Hewlett Packard Enterprise have built a strong relationship. In 2018, Dasher became the fifth largest reseller in North America. Dasher has achieved platinum partner status for more than 15 years. Dasher is committed to earning your trust by wearing your badge and becoming an extension of your team. In 2018, Dasher was awarded HPE Partner of the Year for client satisfaction and transformative IT solutions. Say goodbye to RFPs and hello to a single point of contact for all your IT needs. “Our project had a short timeline (~60 days) and it was very well managed by the Dasher team. All 1,100 access points were installed by the first day of school, which was our goal. Dasher met our milestones and was able to handle the curveballs thrown into the project as well. Aruba put out the 8.0 code and even with the technical changes, the Dasher team was able to adjust to a new line of code and still install everything on time. Clearpass is the backbone of our access control and all of our users, staff, students, and parents have access to the resources as appropriate. Implementing Aruba across a wide variety of devices, a lot of BYOD, was a challenge, but Dasher successfully executed in our complex environment.